The property sector is expected to slow down further this year following cooling measures and tougher lending conditions implemented in 2014. However, the rate of the slowdown may be cushioned with the continuous fall in the price of oil. One of the biggest concerns this year is the possibility of the United States raising interest rates, causing more outflow of funds from emerging markets into that country. However, the falling oil prices are seen as a boon for the property sector. This is because the deflationary effect it is already having on economies. The changing dynamics of lower oil prices on the economy are still unravelling. But economists are not looking at any rate hikes for Malaysia in the near term, unless there are changes in the external sector, and this is something which will work well for the property sector. While oil price is a factor, CIMB said the goods and services tax (GST) is another. In a report entitled “Property Development and Investment: Post GST Blues?”, CIMB Research head Terence Wong foresees a pick-up in buying momentum in the first half of 2015. 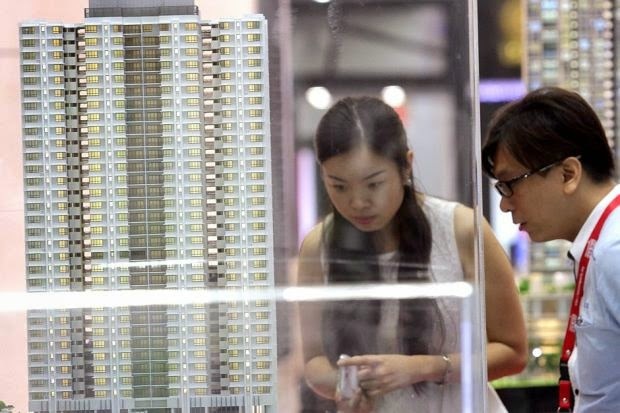 According to Wong, there was renewed interest in property transactions in the second half of 2014. “Buyers will likely adopt a wait and see attitude for six to nine months after that (post GST implementation), which will be in line with the typical consumer behaviour experienced in most countries that implemented GST. The net effect is that 2015 could end up being a similar year to 2014 in terms of property transactions, which we would categorise as a lacklustre year.... 2015 will be tricky,” he says in his report. According to statistics from the National Property Information Centre (Napic), although the country’s overall residential property transactions showed an increase in the first half-year of 2014, this was due mainly to the primary market transitions in Johor, where people buy directly from developers. In the Klang Valley, purchases from developers dropped in the first half of 2014 and increased marginally in Penang. In the second half of 2014, the Johor market reversed, according to developers and real estate personnel there. Although it has often been said that the Johor market is different from the rest of the country, due to the economic growth area of Iskandar Malaysia and the leverage provided by its proximity to Singapore, the feel-good factor which spurred sales and interest there has shifted. Johor-based developer Welton Development Sdn Bhd CEO Thomas C.Y. Ling says the first half of 2014 went on well – good sales figures, great confidence in that market and swarms of investors from around the world. However, things started to change in the second half when negative news begun to filter through. This included the increased toll rates at the Singapore and Malaysia checkpoints, concerns about the possible rise in interest rates, the imposition of cooling measures and tighter lending rules. Ling says “well known” developers begun lowering prices in the middle of last year. He says this, as well as the weakening ringgit, had brought about concerns to foreign investors. Another sign of the times is that buyers are moving away from high-rise projects as prices increase and instead, are investing in landed properties. A Johor-based agent reckons that condominiums priced at RM600,000 and above are seeing this shift towards landed units. Sunway Iskandar launched its first phase of mixed development in Iskandar Johor – Citrine, the Lakeview precinct – and successfully sold out its office suites in the middle of last year. “Sunway’s pricing came with some discounts. So it did well,” the Johor-based source said. The Petaling Jaya-based developer, known also as a theme park developer, is expected to launch landed property this year at fairly “competitive” prices in Sunway Iskandar. “Competition is going to be keen as developers are expected to price launches at lower prices. This is expected to be the trend in 2015 and we have already begun to see that during the second half of 2014,” the source says. “Developers are re-focussing,” she says. China developer Country Garden is launching studio units and units with sea views. Another China developer R&F has “quietened” down, the source says. Developers in Iskandar are holding back or postponing launches and delaying construction. This has resulted in a downward spiral in the Johor property market with most over supply cases in Johor Baru, Danga Bay, and Nusajaya. KGV International Property Consultant executive director Samuel Tan agrees that Johor has “several concerns”. “The first is the over supply of high-rise units and the critical measure would be curbs on lending. The second is the high number of people who were lured into the market by developers interest bearing schemes, without which, they would not have the capital to do so,” he says. Other concerns include the GST and its effect on all sub-segments and the economy. “This year will be a consolidating year for all types of properties,” he says. Landserve (Johor) Sdn Bhd executive director Wee Soon Chit says he is “still optimistic” about the industrial sector and shop office sector in Iskandar Malaysia. The right location, pricing and reputable developer will still work although the general sentiment has been rather weak lately. Those who can afford will start hunting for bargained properties (across the board), Wee says. It will take a little longer for the seller to start dropping prices. There will be more clarity towards the second half of 2015, he says. The situation in the Klang Valley is expected to be similar, says Klang Valley-based real estate professionals. City Valuers and Consultants Sdn Bhd managing director PB Nehru says high value properties – unless they are sold at a perceived bargain – will less likely be transacted. New properties located near the light rail transit and mass rapid transit stations or near the purchasers’ centre of gravity will still be transacted. “Properties that are surplus to immediate needs will not be a priority; the decision to purchase will be postponed,” says Nehru. Having said that, however, he says the Klang Valley has a “large reservoir” of double income middle class households aged below 40 who do not own a “home” of their choice for their own occupation. “They have access to down payments, from parents and savings. They will still buy as the perception in the Klang Valley is that, prices here will always go up as this is where all the productive people live and work,” says Nehru. An issue befuddling the market is the sheer number of launches in 2011 and 2012 (see table). Transactions doubled between 2010 and 2011 from about 30,000 to 56,000 respectively. In 2012, the number of transactions increased to over 60,000 and dropped by a third in 2013. Johor continued to do well in the first half of 2014 while transactions in the Klang Valley dropped. Launches sold in 2012 are expected to enter the market this year, says PA International Property Consultants (KL) Sdn Bhd head of agency Wendy Tong. Many of these buyers are expected to sell their units if they are unable to get the rent that will cover their mortgage payments, she says. “Buyers should not simply buy just to invest, or for the sake of buying. This was the situation the last couple of years. People were buying for the sake of owning a unit here, or a unit there,” says Tong. She says for as long as she can remember, capital appreciation was the main driver in property investments. With slow, little capital appreciation and low yield, there may be little incentive now, she says. Although Napic figures showed that primary residential transactions picked up in the first half of 2014 compared with the same period a year ago, both are a far cry from the first half of 2012. Penang primary transactions were the highest in 2011, increasing more than 440% over 2010 before falling by half in 2012. Penang has continued to slow since. Raine & Horne senior partner Michael Geh says Penang’s secondary market remains fairly active, particularly with landed housing. “There is a correction in certain locations and segments of the high-end condominium market. The often-speculated upon luxury condo market priced RM700,000 and above (or RM800 and above per sq ft) is a bit soft while there is strong demand for units RM400,000 and below. Landed units remain popular; no correction there. “You got to segmentise the market. Penang is very price sensitive,” he says. In the overall retail market, there is expected to be less spending at retail malls. Weak sentiment may prevail, reducing retailers’ ability to pay high rents or even current rents due to less turnovers. Rents will directly affect prices. Thus, there will be limited growth in the capital values of retail properties, Nehru says. As for the office market, supply exceeds demand and this is expected to continue into 2015, Nehru says. The new office space can only be filled by multi-national companies (MNCs), government-linked corporations and public listed companies. “They will insist on Grade A dual compliant office buildings for prestige purposes. But MNCs and foreign direct investments will only come if the country’s perceived narrow politics, security, graduate education system and standard of English improves from what they are now,” says Nehru. If occupancies, rent and total net rental income cannot increase, prices are unlikely to increase. Older buildings will also continually lose tenants to the newer buildings and are likely to be converted to other uses such as hotels, hostels or be demolished for redevelopment. At press time, crude oil is touching US$53 per barrel. The sliding oil price will impact the office market, especially in the Kuala Lumpur city centre, the base for many oil majors.